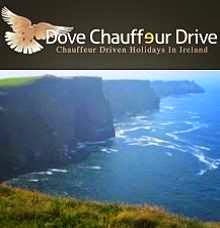 HOLIDAYS in IRELAND: Killarney, Torc, and Ladies View on Cauffeurdriven tour with Dave Hogan and Dovechauffeurdrive. Killarney, Torc, and Ladies View on Cauffeurdriven tour with Dave Hogan and Dovechauffeurdrive. How better could you post a picture of the famous "Ladies View in Killarney than to have a lady doing just that. Here we have Dorothy, taking in this spectacular view from high in the mountains outside Killarney. This is the spot where Queen Victoria stood, and declared this to be "the most beautiful view in the Kingdom". On your way up to Ladies view you can spend time enjoying a short stroll through the woods to see the lovely Torc Waterfall. Here we have Dorothy and Joanne, making their way through the trees on their way to the Falls. It may not be Niagara, but it is beautiful, and what a lovely picture of these two lovely ladies, as they pose together, with the waterfall in the background. Another lovely picture of the ladies, with the magnificent lakes of Killarney in the valley down below. We just had to get a picture of the ladies posing with this berry laden tree adding even more colour to this magnificent area. Well if you are looking for Leprechauns, than this is the kind of place you are most likely to find them. Make sure you come here at night, but be prepared, as these little guys like to play tricks on you, especially if you are a tourist. Just make sure that you do not try to play tricks on them, nothing annoys them more. Like a lot of us Irish, they like to clown around a little. Political correctness is not a big deal with them. Maybe we could learn from them and not take everything so seriously, and learn how to laugh at ourselves again. To post a comment you must select one of the profiles from the drop down list. If in doubt then please just select anonymous. All photographs © Dave Hogan. Picture Window theme. Powered by Blogger.